It lists all classes and functions that were used during a program run organized by modules and namespaces. All elements are alphabetically sorted. 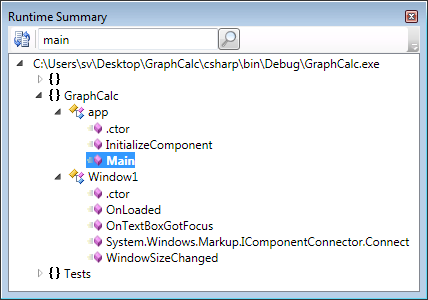 New functions are added in real time and removed by the Clear command the same way as in the Runtime Flow window. Search field allows you to search for namespaces, classes and functions. Each new search continues from the selected node. The Locate in flow toolbar button finds the selected class or function in the Runtime Flow window. Press the Locate in flow button again to find the next occurrence.